Asbury Park, NJ, March 15, 2018 – Part CBGB, part Cheers, and part Barney's Bowlarama, Asbury Lanes embodies everything special about Asbury Park, the character-filled Jersey Shore city whose revival has made it the comeback story of the decade. But after a half-century of use, structural and mechanical issues plagued the Lanes, which faced imminent danger of closing – or demolition. Now, Asbury Park is about to reclaim the gathering place that many consider its beating heart. 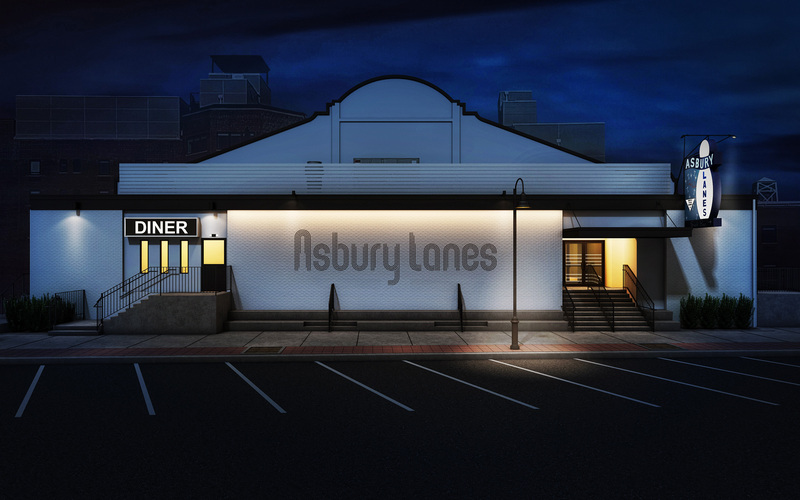 After a loving restoration aimed at keeping as many original features as possible, Asbury Lanes will reopen Memorial Day weekend as the same anything-goes local hangout it always was - and reborn as a state-of-the-art music venue whose wild history permeates every square foot. Brunswick, the world’s leader in bowling machinery, will unveil a back-to-the-future pin-setting system unique in the world and custom-built for Asbury Lanes. 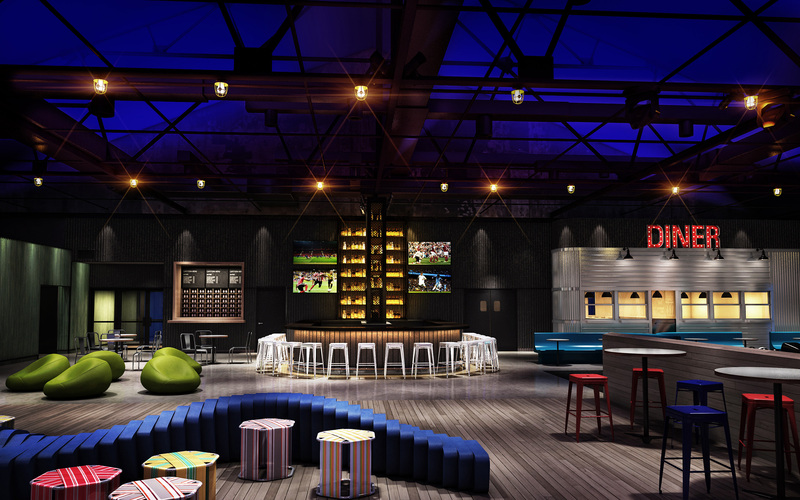 And the spirit of the venue’s famed snack bar will infuse a new, built-from-scratch diner inside the Lanes, complete with classic interior and huge neon sign. A “secret” passage will run between the Lanes and The Asbury, the game-changing hotel next door that was the first part of the widely acclaimed, multi-billion-dollar redevelopment of Asbury Park by real-estate investment company iStar (NYSE: STAR), whose roots in town stretch back a decade. Designed by world-renowned Anda Andrei, President of Anda Andrei Design, The Asbury was ranked the best new hotel in a USA Today poll, and hailed as “one of the world’s best new hotels” by Travel + Leisure. Some history: Asbury Lanes opened in the 1960s as an 18-lane bowling alley. As young creatives flocked to the seaside city in the early 2000s, they saw its potential as an alternative music and arts venue. The first concert at Asbury Lanes with heavy rock band Lord Sterling took place on a makeshift stage as balls rolled and pins tumbled in the background. The Lanes became legendary for its DIY origins – and its esteem in the hearts of artists, musicians, and audiences. Over the last five decades, the Lanes has hosted musical acts including The Bouncing Souls, Me First and the Gimme Gimmes, and Mick Jones of The Clash, among many others. The venue’s original capacity of 300 will more than double in the renewed space. 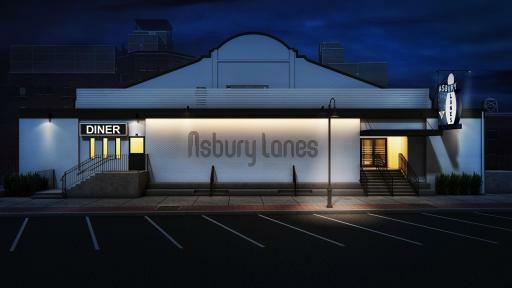 Asbury Lanes will announce its first opening act this spring. Andrei, who serves as the creative lead for the entire Asbury Park redevelopment project, involving more than 20 individual projects, is overseeing a restoration for Asbury Lanes that reclaims and refracts the venue’s incredible visual heritage - like the layers and layers of rock posters plastered on one wall that’s getting meticulously preserved. Andrei enlisted architect Dominic Kozerski of New York’s acclaimed bonetti/kozerski on rejuvenating the building. iStar’s “back to the future” approach starts with the exterior. “There’s no flash,” said Andrei. “No one wants it too polished. This is a meaningful building.” Instead, the structure will be “lit and celebrated” to highlight its heritage and history. “This is going to be the fun, open, wild Lanes everyone loves, except we won’t have to worry that it might cave in,” she said. The Lanes’ world famous bowling-pin sign, so beloved by locals, will get reinstalled after a painstaking restoration, while its classic logo will receive a modern twist on the newly white washed exterior brick walls. The famous ocean-maid mural by local Asbury Park artist Pork Chop will get refreshed and expanded; a real beam of light will stream from the lighthouse in the maiden’s hand. iStar will commission Pork Chop for a second mural, depicting an entangled octopus and squid, on the building’s opposite side. Likewise, interior walls will keep their “many, many” layers of paint, Andrei said. “They have an amazing patina. And there’s significant, authentic stuff under there.” By a happy accident, stark temporary lighting that had been installed during construction will become the Lanes’ permanent lighting scheme. “The construction lighting just looked so cool, we decided to stick with it,” Andrei said. Though not apparent from the outside, the building required “extensive work,” said Kozerski. Underneath the Lanes’ wood floors, concrete had been laid without foundations; only sand anchored the structure. The roof required replacement. Bringing the building up to New Jersey construction codes meant replacing a single entrance with three separate doors. The Lanes’ lighting system was no longer adequate. 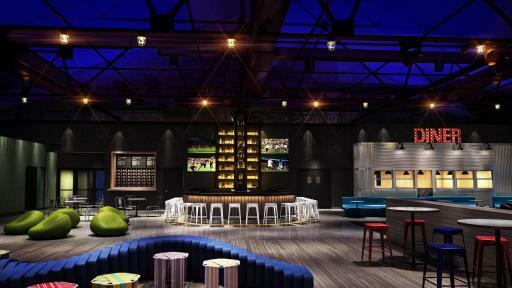 Along with the restoration itself, iStar is sparing no expense where it really matters – music, food, and bowling. 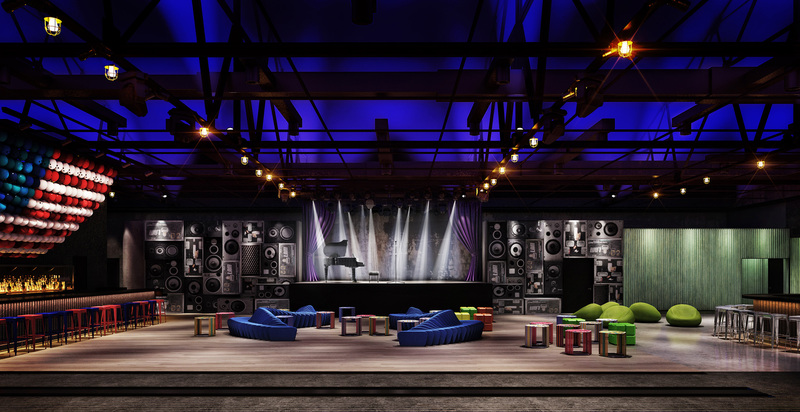 A partnership with The Bowery Presents, one of the nation’s leading live-music promoters, will bring a curated mix of both leading and up-and-coming talent to the Lanes’ re-invented stage. Clair Brothers, the Pennsylvania company which famously installed speakers at Woodstock, has custom-built a sound system for Asbury Lanes to rival any club in the world. 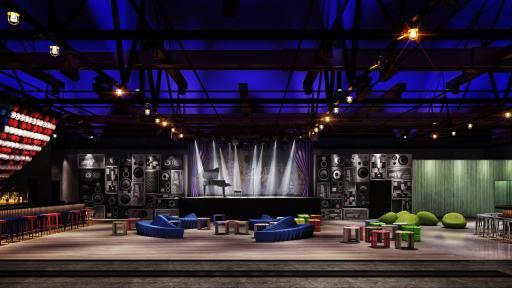 Nashville’s Cour Design, whose lighting clients have included LCD Soundsystem and Nick Jonas, is installing a mind-blowing lighting system. 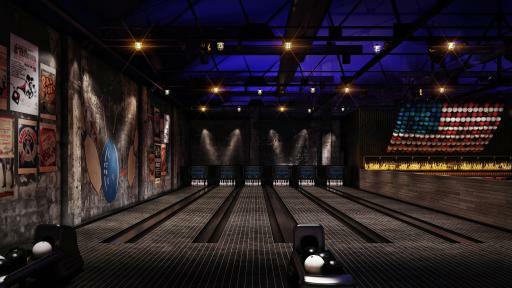 During concerts, platforms will cover bowling lanes, allowing for a capacity of 746 – double its former limit. A full-scale, classic diner, built from scratch inside the Lanes, will rely on local purveyors and farms for its menu of updated favorites. In season, the diner will stay open 24/7, just like Asbury Park itself. Bowlers will be thrilled to learn that Brunswick created a special pin-setting machine for Asbury Lanes at the urging of iStar’s Sugarman. 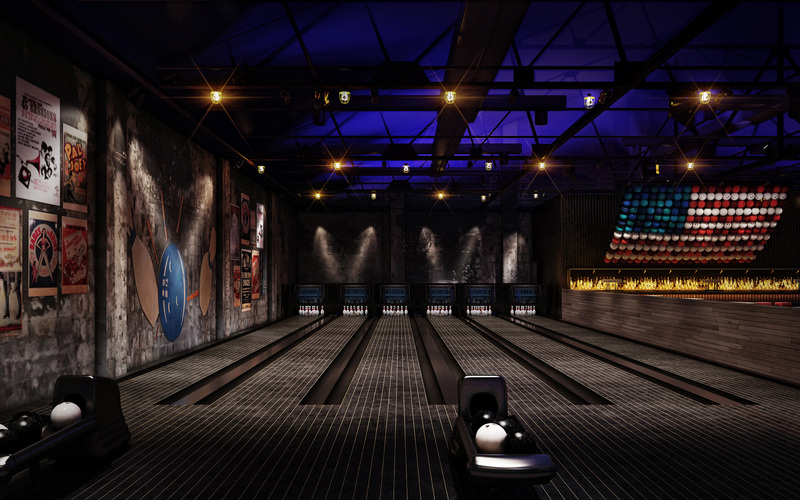 Bowling will be celebrated throughout the Lanes, with an American flag made of red, white, and blue bowling balls and a bowling-shoe rental counter constructed from wood salvaged from the Lanes’ original lanes. The Bowery Presents is the leading New York City-based concert promoter on the East Coast, dedicated to bringing the best artists to the New York City tristate area and venues stretching from Maine to the Gulf Coast, including Philadelphia, Boston, Baltimore, Virginia, and South Carolina. Since its inception, The Bowery Presents has been a purveyor of true artist development and consistently strives to work with artists like LCD Soundsystem, My Morning Jacket, Mumford & Sons, and Sam Smith grow from performing in intimate clubs to performing in sold-out arenas, providing the best concert experience for both fans and artists alike. As a trusted industry tastemaker, The Bowery Presents produces dynamic entertainment experiences at dozens of venues nationally, producing thousands of shows annually.